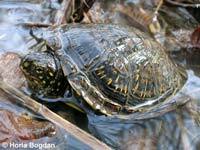 Emys orbicularis, the European pond turtle, is a member of Emydidae within Cryptodira. Emys orbicularis is the only member of Emydidae that occurs in the Old World, and is also the only turtle to occur throughout most of Europe (Ernst and Barbour, 1989; Bonin et al., 2006). Emydidae contains the most species of any turtle group, and has an evolutionary record stretching back 80 million years (Ernst and Barbour, 1989; Bonin et al., 2006). Emydidae is closely related to the Old World pond turtles and tortoises (Geoemydidae and Testudinidae, respectively), but the relationship of these three close relatives to other turtles is unclear (e.g., Gaffney and Meylan, 1988; Joyce, in press). 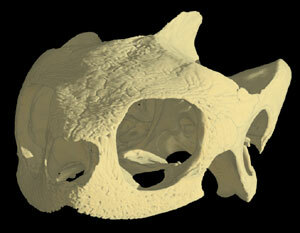 Emys orbicularis is of medium size, reaching a carapace length of 21 cm (Ernst and Barbour, 1989; Bonin et al., 2006). The skull is relatively small and exhibits extensive emargination. There is a double articulation between the fifth and sixth cervical vertebrae (Ernst and Barbour, 1989). The carapace is oval and somewhat flattened. The plastron is well developed and a hinge is present between the hyo- and hypoplastra. The digits are webbed, and the tail is relatively long. Dorsally, E. orbicularis ranges from olive-brown to black, and exhibits yellow radiations or dots. The plastron ranges from black to yellow, and each scute has a black border. Males have red eyes, while females have yellow eyes (Ernst and Barbour, 1989; Bonin et al., 2006). Emys orbicularis ranges throughout continental Europe, from the Caspian Sea to the Atlantic coast, and occurs in Morocco, Algeria, and Tunisia, and its range formerly included the Scandinavian countries and England (Ernst and Barbour, 1989; Bonin et al., 2006). It prefers slow-moving fresh water bodies with soft bottoms and abundant vegetation. Emys orbicularis is carnivorous, and actively hunts invertebrates, amphibians, and fishes, both in and out of water. Females lay several clutches of three to 16 eggs, and often do not reproduce every year (Ernst and Barbour, 1989; Bonin et al., 2006). Emys orbicularis is listed by the IUCN as near-threatened. The specimen was scanned by Matthew Colbert on 3 August 2004 along the coronal axis for a total of 630 slices. Each 1024 x 1024 pixel slice is 0.055 mm thick with an interslice spacing of 0.055 mm and a field of reconstruction of 26 mm. Cadi, A. and P. Joly. 2004. Impact of the introduction of the red-eared slider (Trachemys scripta elegans) on survival rates of the European pond turtle (Emys orbicularis). Biodiversity and Conservation 13:2511-2518. Ferri, V. 2002. Turtles and Tortoises. Firefly Books, Willowdale, Ontario. Ficetola, G.F. and F. De Bernardi. 2006. Is the European "pond" turtle Emys orbicularis strictly aquatic and carnivorous? Amphibia-Reptilia 27:445-447. Ficetola, G.F., Padoa-Schioppa, E., Monti, A., Massa, R., De Bernardi, F., and L. Bottoni. 2004. The importance of aquatic and terrestrial habitat for the European pond turtle (Emys orbicularis): implications for conservation planning and management. Canadian Journal of Zoology 82:1704-1712. Jamniczky, H.A. In press. Turtle carotid circulation: a character analysis case study. Biological Journal of the Linnean Society. Jamniczky, H.A. and A.P. Russell. 2007. 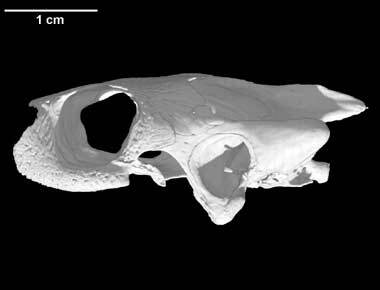 Reappraisal of patterns of nonmarine cryptodiran turtle carotid circulation: evidence from osteological correlates and soft tissues. Journal of Morphology 268:571-587. Joyce, W.G. In press. A phylogeny of Mesozoic turtles. Bulletin of the Peabody Museum of Natural History. Lebboroni, M. and G. Chelazzi. 2000. Waterward orientation and homing after experimental displacement in the European Pond Turtle, Emys orbicularis. Ethology Ecology & Evolution 12:83-88. McDowell, S.B. 1964. Partition of the genus Clemmys and related problems in the taxonomy of aquatic Testudinidae. Proceedings of the Zoological Society of London Series B 143:239-279. Mitrus, S. 2006. Fidelity to nesting area of the European pond turtle, Emys orbicularis (Linnaeus, 1758). Belgian Journal of Zoology 136:25-30. Orenstein, R. 2001. Turtles, Tortoises, and Terrapins: Survivors in Armor. Firefly Books, Buffalo, New York. Pritchard, P.C.H. 1979. Encyclopedia of Turtles. TFH Publishing, Neptune, Florida. To cite this page: Dr. Heather A. Jamniczky, Dr. Anthony P. Russell, University of Calgary, 2007, "Emys orbicularis" (On-line), Digital Morphology. Accessed April 25, 2019 at http://digimorph.org/specimens/Emys_orbicularis/.